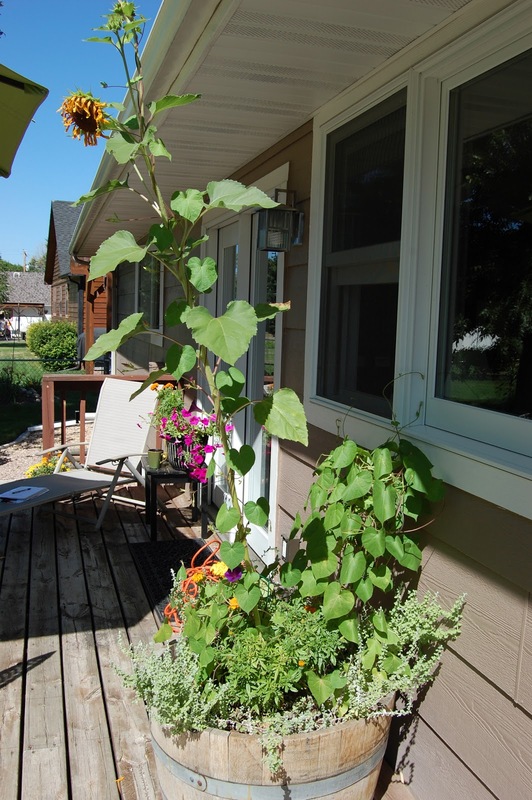 Nothing like a big volunteer sunflower to plant itself in a pot - thanks to visiting birds. I love it! So everyday I look out my kitchen window, I see this growing sunflower. How perfect is that? Also in the wine barrel is morning glory, marigolds and licorice plant. I got a flat of this licorice plant at Safeway and I simply love it! I've always been drawn to that artemisia gray green color. It does not need a lot of water and looks great in containers. I am hoping it will make it through the winter. One note, I have had two birds fly into my kitchen window as I think they were swooping in for seeds. Fortunately, they were just stunned and flew away. The perils of glass!